Cards Dozio is always in step with the times and in line with the required skills . The adoption of a S.Q. as a business management tool, it allows one hand to strengthen the relationship with customers, and on the other hand to propose new products/services having better outlined upstream customer needs . 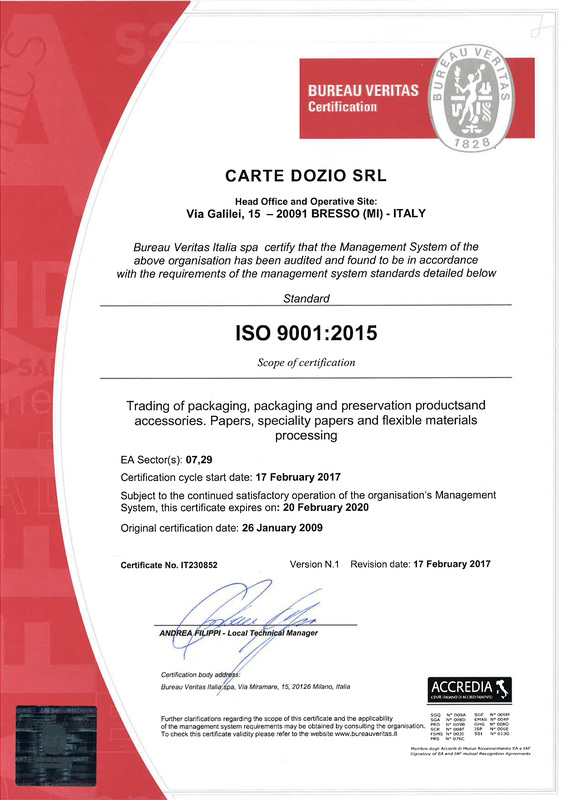 The System of management for quality of Carte Dozio is certified since 2009 according to the ISO 9001:2008 standard and its requirements are applied daily in the management of the commercialization of products and accessories for packaging, the packing itself and protection as well as in the modification of paper, specialty paper and flexible supports. 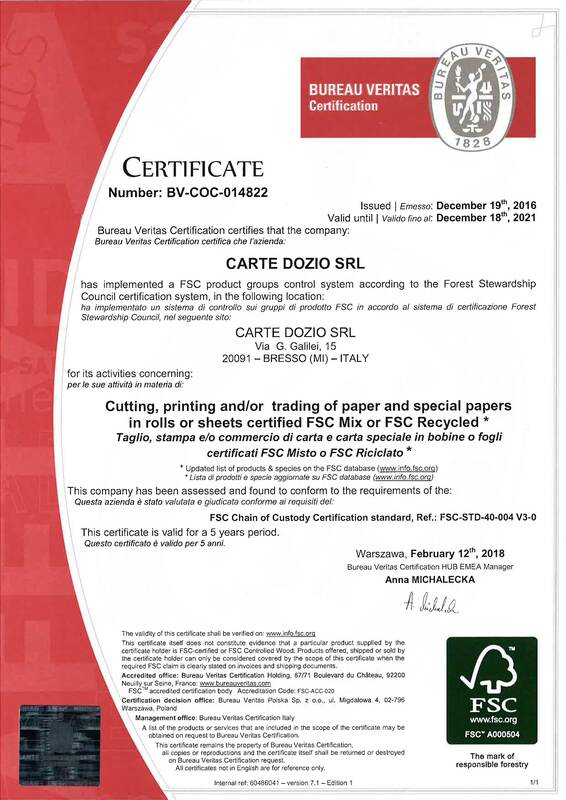 Since December 2011 Carte Dozio has the FSC®Forest Stewardship Council Chain of Custody certification which promotes the sustainable management of forests all over the world and insures the provenance of cellulose from plants who meet the world’s most stringent environmental, economic, and social standards for responsible forest management. 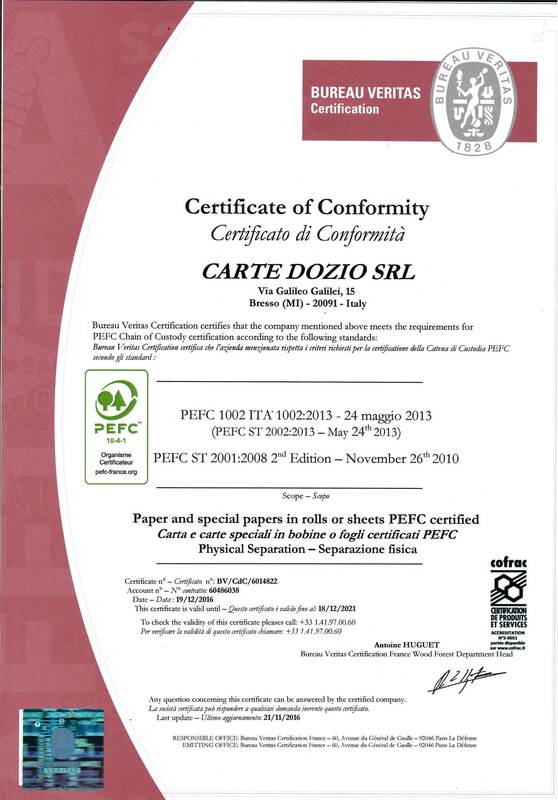 Since December 2011 Carte Dozio has the PEFC™ certification which promotes sustainable forest management. PEFC™ marked products offer a guarantee on the origins of the cellulose and this choice underpins social responsibility and an opportunity to formalise entrepreneurial commitment towards the environment and to advance sensible and sustainable management of natural resources. 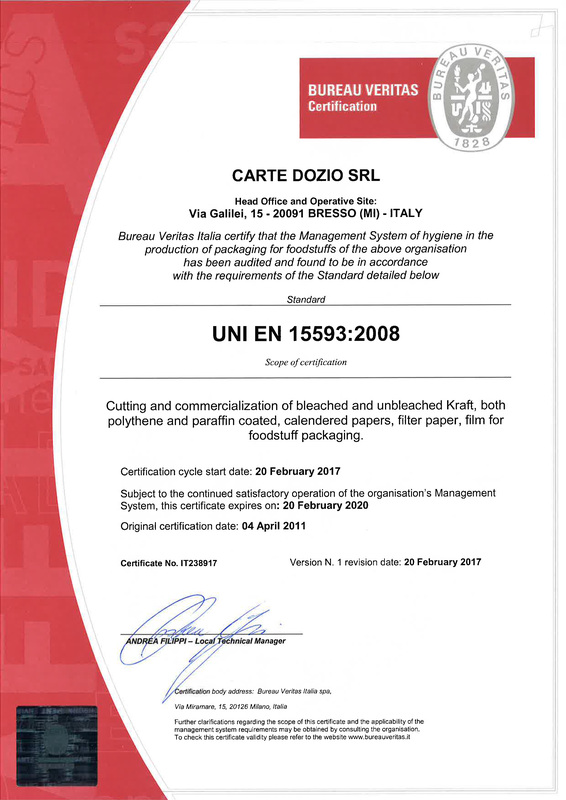 Since 2011 Carte Dozio uses a management system for hygiene in the production of packaging materials destined for contact with food certified by Bureau Veritas according to the UNI EN 15593 standard. The European standard, to which the status of national standard is applied, certifies the application of GMP (Good Manufacturing Practice) giving a Harmonised System based on principles of analysis and risk assessment in order to define appropriate degrees of control.